Our condo, that we call the Destin Dawghouse is a great getaway so you can rest and relax! You will not think about the hustle and bustle while you are relaxing on the gulf view balcony watching the water. Our well decorated condo is just steps to the famous sugar white sand of Destin, where you can continue to 'just do nothing'. We don't even put shoes on to walk over to to the beach! Our two bedrooms have a king size bed, flat screen tv and and its own attached bathroom. We have extra hall bunk beds for the kids. The kitchen is fully equipped should you decide to eat in. From March to October we offer beach service (umbrella and two chairs set up for you on the beach by Twilight Beach Service). We love those guys! We are the only condo in our complex that offers this perk to our guests - because we love having the service when we visit! Check-in is at 3:00 but you may begin using our beach chairs as early as 10 am on the date of arrival. Our complex has a small swimming pool for the kids. The deepest section is 5 feet. Next to it is a hot tub that seats about 8. The community bbq pits and a picnic table is just below our balcony. If shopping therapy is your form of relaxation, we are near all the hot spots of Destin shopping! Fishing and other off-beach family activities are also close by. If fresh air is your thing, there is a great walk/jog/bike palm tree-lined trail right out front. We keep beach toys in the condo for your use. Just pack your swimsuit, sunscreen and towel and you are ready to get away! 1. For your comfort, we suggest that no more than 4 adults stay in our condo (any other adults will be sleeping in a bunk bed). 3. We no longer offer a sofa sleeper. 4. Absolutely no pets. Condo rules prohibit guests from having them. 5. No smoking in our unit or on our balcony. 6. This is a second floor unit in a three-story condo. We discovered the Emerald Coast when our second son was born and fell in love with the amazing beaches. We picked our condo because of its great location to everything that will keep our active family busy yet in the 'sweet spot' of a laid back cottage-y old Florida neighborhood. Come visit soon! We chose the Crystal Beach area because of the charming old Florida style neighborhood with no high-rise buildings. We looked at several high-rise condos but were disappointed with the limited beach access. We did not want to have to stake a beach spot at 7am...here, there is plenty of space for everyone! We visit our condo on a regular basis and like to keep it updated for our own enjoyment. We are happy to share our vacation home with great guests. Beach Service, Beach Service, Beach Service (for guests staying between March and October 31st). Very few across the street rentals offer this fabulous perk! Gulf view from the large balcony. Three 32" HDTVs (Living room, Master bedroom & Guest bedroom). Living room has DVD player. With wide club chairs and patio dining set. Community pool is heated to 80-84 degrees during the cooler months. This is our second stay at the Destin Dawghouse and once again it did not disappoint. The condo was clean, comfortable and had everything we needed. 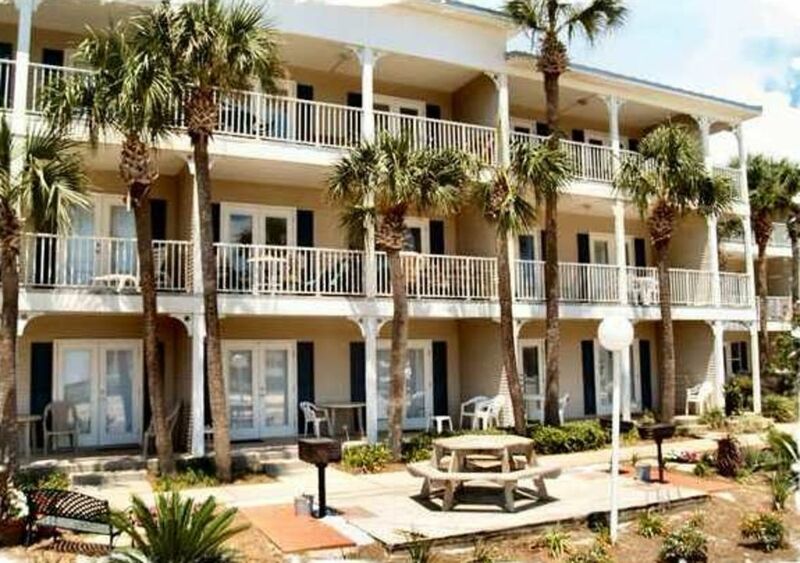 The location is perfect with easy access to the beach, restaurants and shopping. We also love the chair service at the beach! We will be back again.......not soon enough!! Overall we had an enjoyable stay. The bedding is newer and comfortable. Linens are very nice. The view of the gulf is awesome and there is plenty of room in the spacious condo. It could have been cleaner for our arrival. We took care of that ourselves. Kitchen is well equipped to prepare meals with newer dishes and utensils. Appliances are older as is living room furniture. A new sofa and chair are needed. Floors are new. Perfect area for walking the trail and beautiful beach. Owner was responsive quickly to any issues we encountered. Thanks for the opportunity to stay. Love this area of Destin. Pool was great. I am glad that you had an overall enjoyable experience at our family's condo during your month-long stay. Thank you for taking time to provide feedback on what our cleaners failed to do (crumbs on dining table, wipe down kitchen floor and clean microwave). I have passed the information to them. I agree, besides the beach, the walking trail is one of the best things about our condo's location. Y'all were very friendly guests. Thanks for visiting us! Thank you for the king beds, the gorgeous sheets, and nice towels! Beautiful wine goblets, too! This condo is spacious, clean, comfortable and beautifully decorated. Only a short stroll to the beach with a perfect two chair and umbrella setup included, an added bonus! Centrally located to everything! Highly recommend! Very cute, clean and inviting condo! Great location! We had a great week at this condo. Beach was right across the street. The balcony was really nice with the exceptions of the downstairs smokers. It would be nice to have a nonsmoking policy. We did not have any issues with the condo itself. The Condo was not far from local grocery stores and the restaurants. The beach was beautiful! The water was crystal clear all week. Great week! We love Destin and we love the Dawghouse! This was our second year staying here and we hope to be back again next summer! I adore the condo, the patio, the location and of course the beach set up! Sayuri is super great and very accommodating....A pleasure to deal with! Rates are subject to change until booking. NO PETS OR SMOKING ALLOWED. Requires at least one guest to be 25+ years old to rent. 7 night Saturday to Saturday rentals from March - October. Please review all terms of agreement prior to booking. No refunds within 60 days of arrival. Cancellation fee $100.